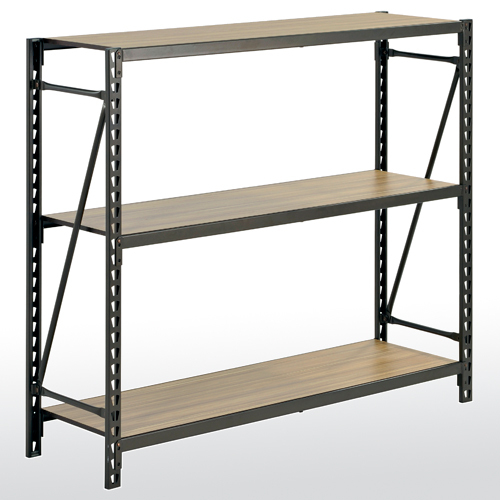 Durable all steel construction with perforated iron plate shelves. Shelves can be quickly adjusted in 1" increments to accommodate storage space needs. Each shelf holds up to 110 lbs. capacity of evenly distributed loads. Posts come with adjustable levelers to facilitate use on even surfaces. Easy to assemble in just minutes without tools. Durable powder coat finish in white. 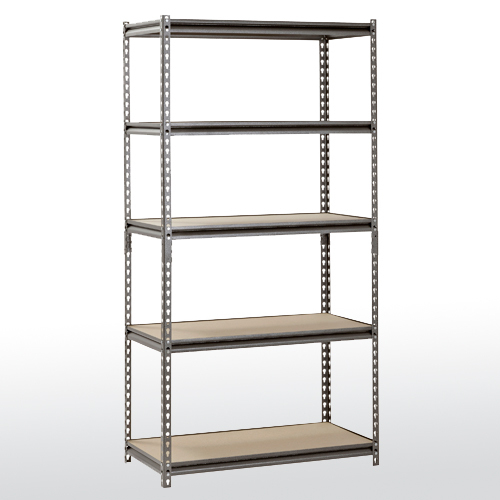 Durable all steel construction with perforated iron plate shelves. Shelves can be quickly adjusted in 1" increments to accommodate storage space needs. Each shelf holds up to 110 lbs. capacity for 12" deep unit and 300 lbs. capacity for 14" deep units, all based on evenly distributed loads. Posts come with adjustable levelers to facilitate use on even surfaces. Easy to assemble in just minutes without tools. Durable powder coat finish in white. 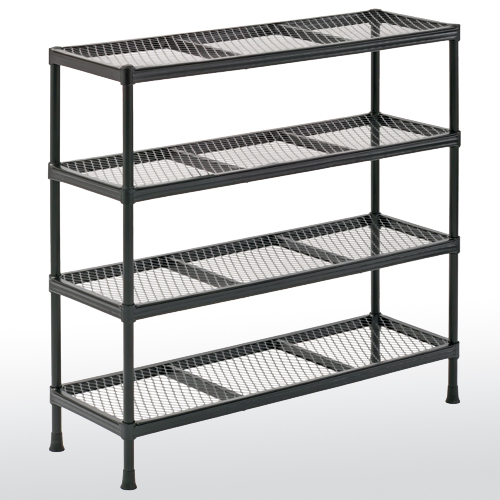 Durable all steel construction with perforated iron plate shelves. Shelves can be quickly adjusted in 1" increments to accommodate storage space needs. Each shelf holds up to 330 lbs. capacity of evenly distributed loads. Posts come with adjustable levelers to facilitate use on even surfaces. Easy to assemble in just minutes without tools. Durable powder coat finish in white. Heavy duty steel construction with durable silver enamel finish. 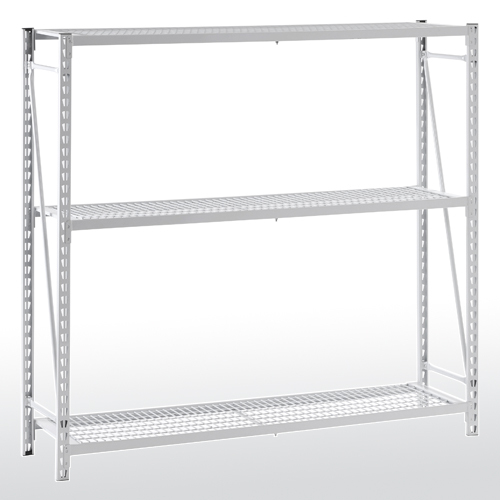 Five shelves with wire decking can be adjusted in 1-1/2" increments. 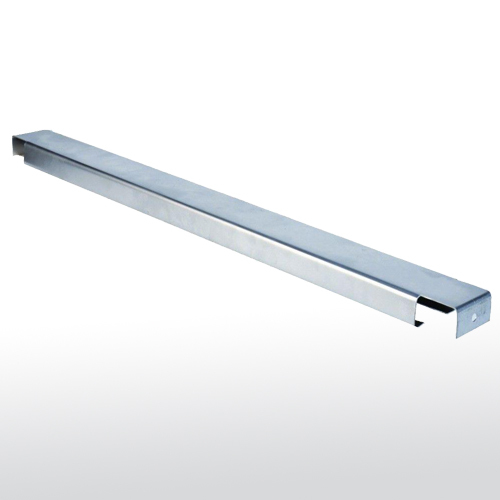 Multi-functional, 3-way beams can be set up as a flush shelf or tray shelf. Rivet lock system provides strength and rigidity and is easy to assemble, no nuts or bolts. 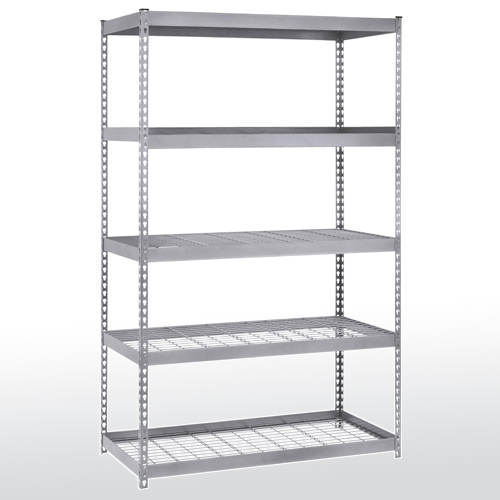 Unit can be assembled vertically as shelves or horizontally as a workbench. Unit is NSF Certified. Industrial grade steel construction with Z-Beam design for strength and rigidity. 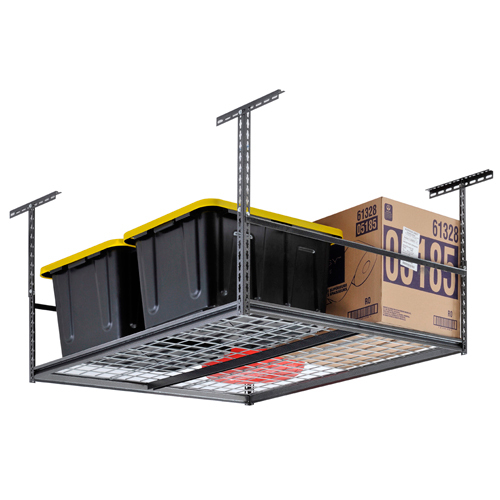 Holds up to 4000 lbs total weight or 800 lbs on each individual shelf. 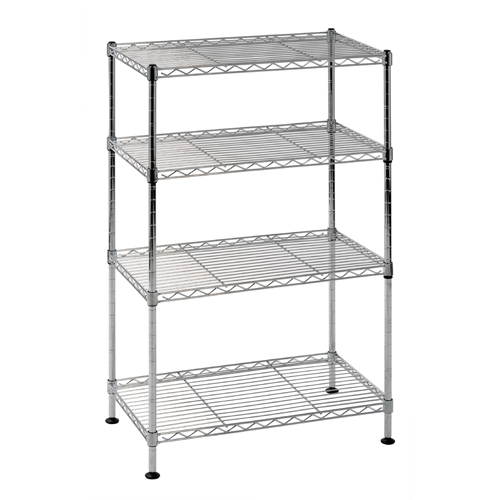 Five shelves with wire decking can be adjusted in 1-1/2" increments for a customized storage space. Assembles in minutes with no nuts or bolts as a vertical shelving unit or horizontal as a workbench. Durable powder coat finish in red. Industrial grade steel construction with Z-beam design for strength and rigidity. Holds up to 4,800 lbs. total weight, or 800 lbs. per shelf, based on evenly distributed loads. 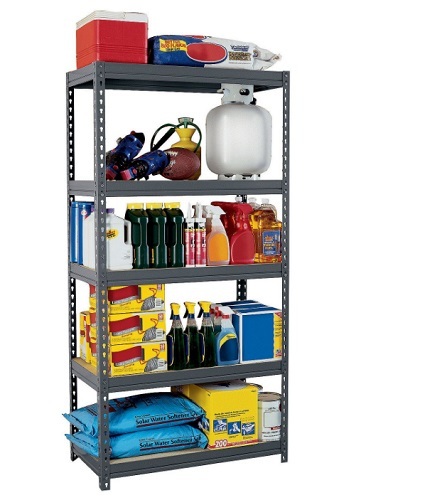 The six shelves adjust every 1-1/2" to create a customized storage space with ease. Laminate board shelves resist moisture and are easy to clean. Assembles in minutes without nuts or bolts as a vertical shelving unit or horizontal as a workbench. Silver enamel finish. Unit is NSF Certified. Industrial grade steel construction with Z-Beam design for strength and rigidity. 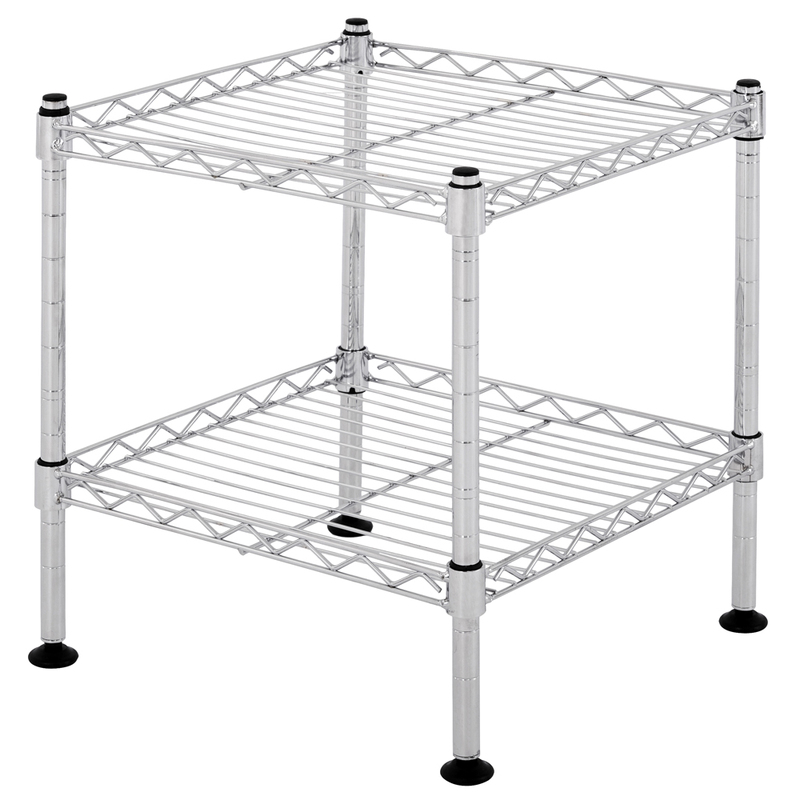 Holds up to 4,000 lbs total with its five fully adjustable shelves, or 800 lbs with each shelf. 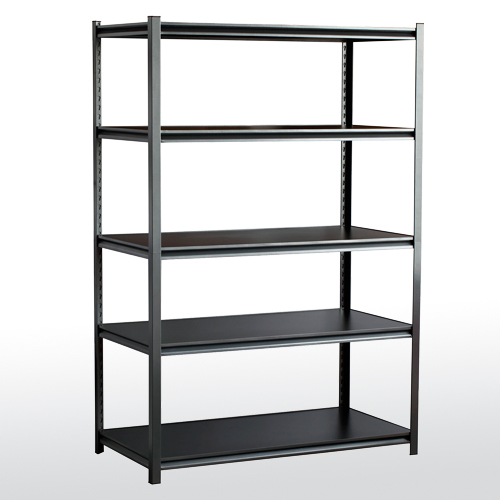 The five shelves are fully adjustable every 1-1/2" to create a customized storage space with ease. Laminate board shelves resist moisture and are easy to clean. Smooth post design conceals assembly. Assembles in minutes without nuts or bolts as a vertical shelving unit or horizontal as a workbench. Durable and attractive silver vein finish. 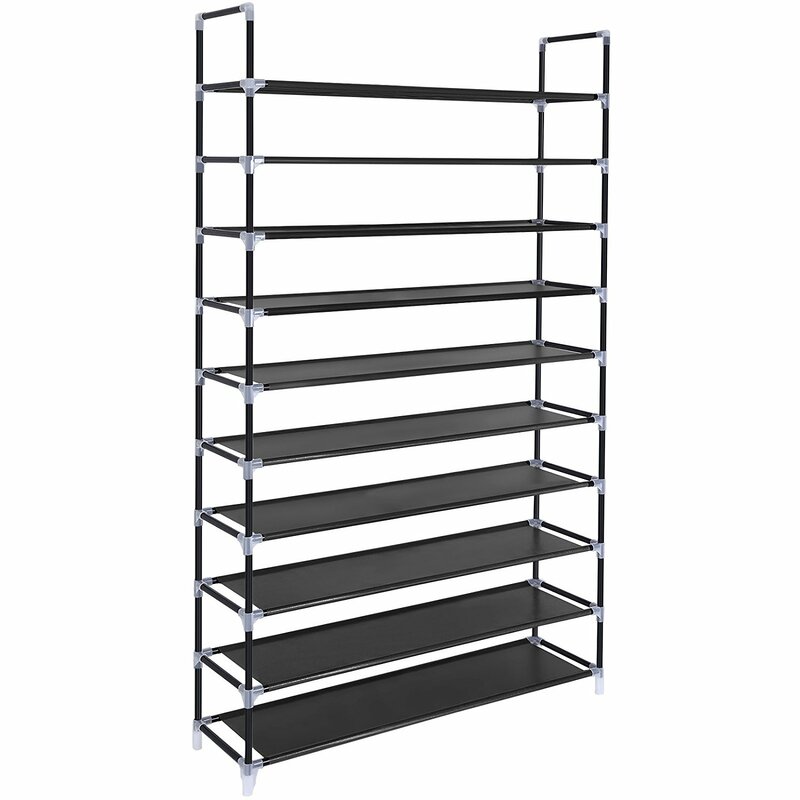 Four ventilated steel shelves to store and organize shoes in one convenient location. Great for closets, mudrooms, entryways. Adjustable leg levelers. Black powder coat finish. 100 lb. total capacity. 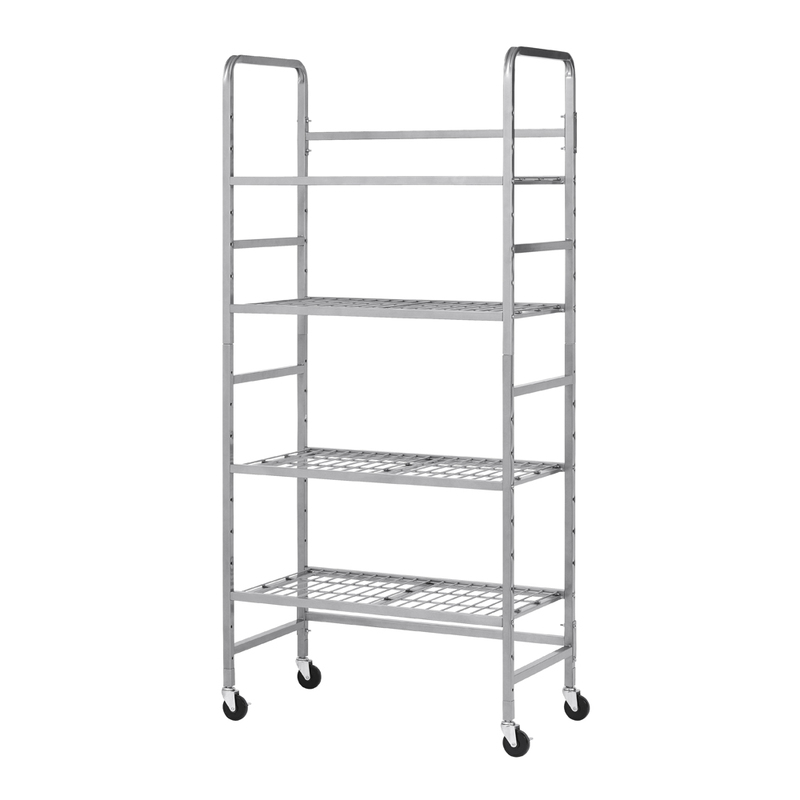 Industrial strength steel construction with durable silver-vein finish. Z-Beam design beams for strength and rigidity. Six shelves with white laminate board decking can be adjusted in 1-1/2" increments. The laminate shelves resist moisture are easy to clean. Smooth post design conceals assembly. Assembles in minutes with no nuts or bolts as a vertical shelving unit or horizontal as a workbench. Industrial grade steel construction with durable silver vein finish. Z-Beam design beams for strength and rigidity. Five shelves with particle board decking can be adjusted in 1-1/2" increments. Shelves hold up to 800 lbs of evenly distributed weight. Includes post couplers to make assembly faster and easier, no nuts or bolts. Can be assembled vertically or horizontally as a workbench. Industrial grade steel construction. Shelves hold up to 800 lbs. of evenlydistributed loads and adjust in 1½” increments. 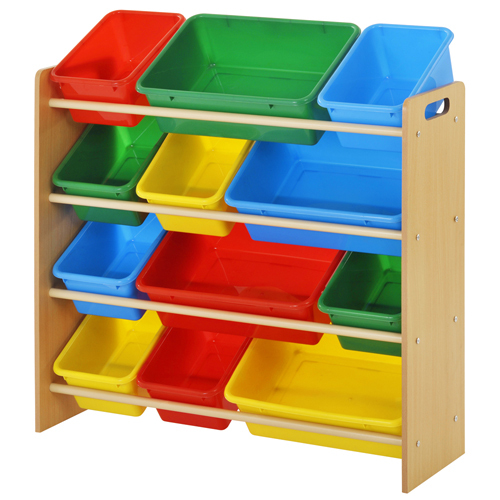 Five durable particle boardshelves. Easily assembles in minutes either vertically or horizontally. Gray powder coat finish. Durable welded wire construction with open design permits sprinkler, air and light penetration and reduces dust build-up. Shelves are adjustable in 1" increments. Includes four 2" nylon casters for easy mobility. Easy to assemble in just minutes without tools. 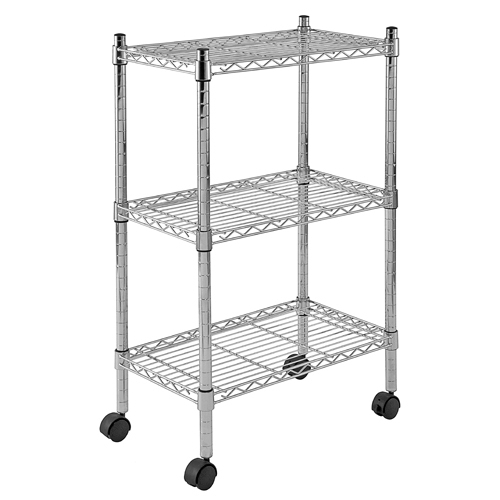 Maximum weight capacity per shelf is 250 lbs., evenly distributed. Chrome-plated finish. NSF Certified. Strong and durable welded wire construction with open design permits sprinkler, air and light penetration and reduces dust build-up. 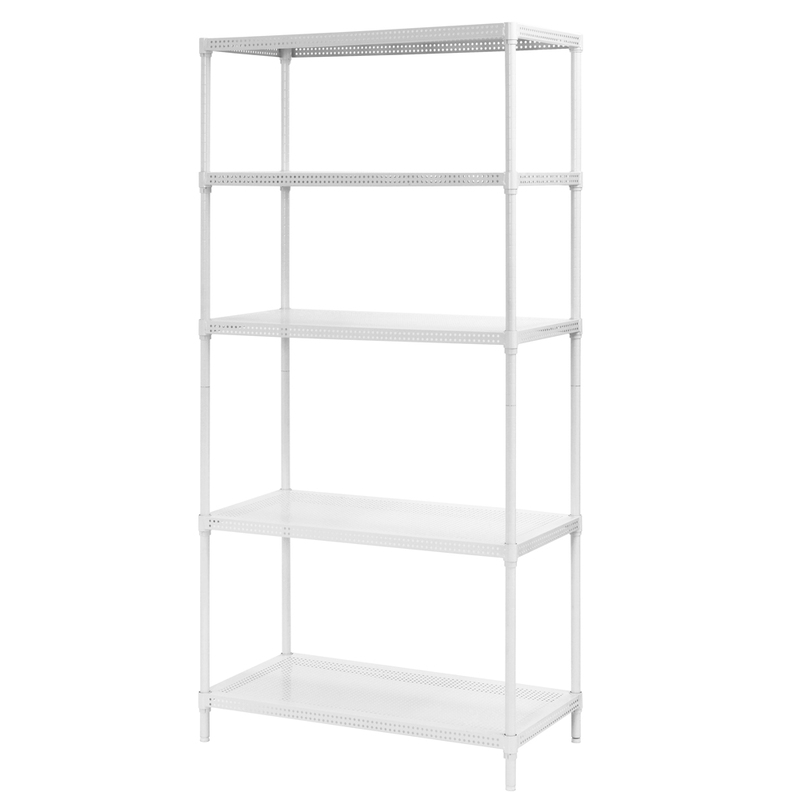 Includes five shelves adjustable in 1" increments. Four 3" rubber casters, 2 with locking brakes. Also includes adjustable leveling feet. Units are easy to assemble in just minutes without tools. 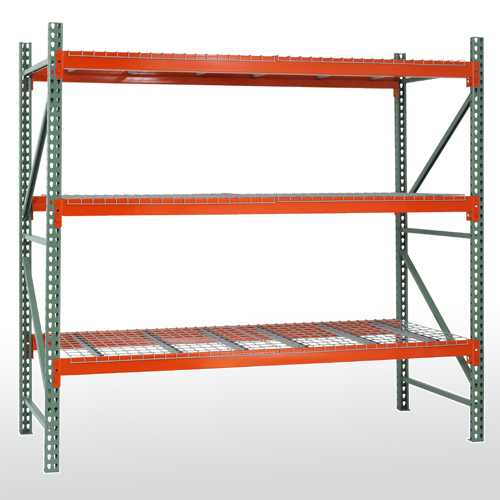 Maximum weight capacity per shelf is 500 lbs., evenly distributed. Chrome-plated finish. Ideal for laundry room, bedroom, closet, basement, garage. 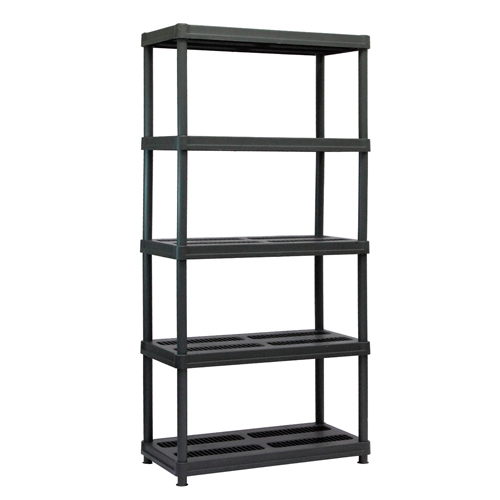 Durable and sturdy steel construction in black finish. Three wire shelves for storing folded clothes and a garment bar for hanging items. Shelves hold up to 150 lbs. Includes canvas cover which completely surrounds the frame to protect garments from dust and other debris. Four 1-1/2" casters to make moving easy. NSF Certified. Strong and durable welded wire construction with open design permits sprinkler, air and light penetration and reduces dust build-up. 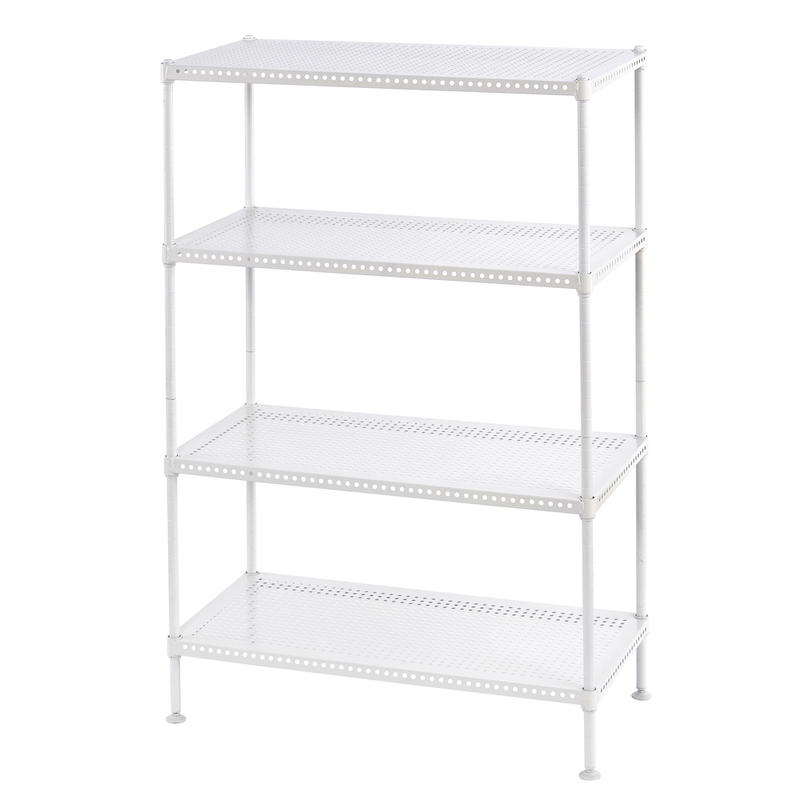 Includes four shelves that easily adjust in 1" increments. Adjustable levelers for uneven flooring. Units are easy to assemble in just minutes without tools. Shelves hold up to 600 - 800 lbs. capacity. Chrome-plated finish. 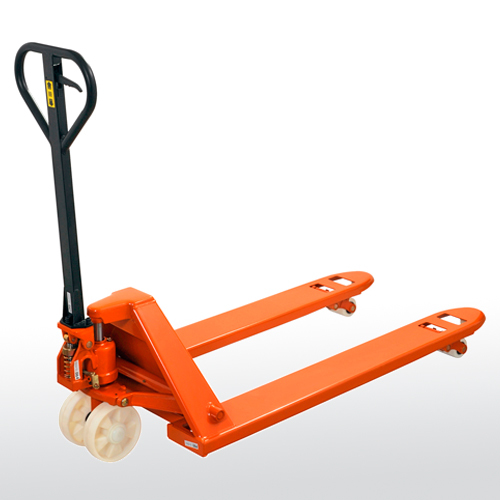 Optional casters are available; adding casters will reduce the overall weight capacity of the unit to 660 lb. or 1000 lbs. (see casters for exact capacity). Durable welded wire construction with open design permits sprinkler, air and light penetration and reduces dust build-up. Shelves are adjustable in 1" increments. Easy to assemble in just minutes without tools. 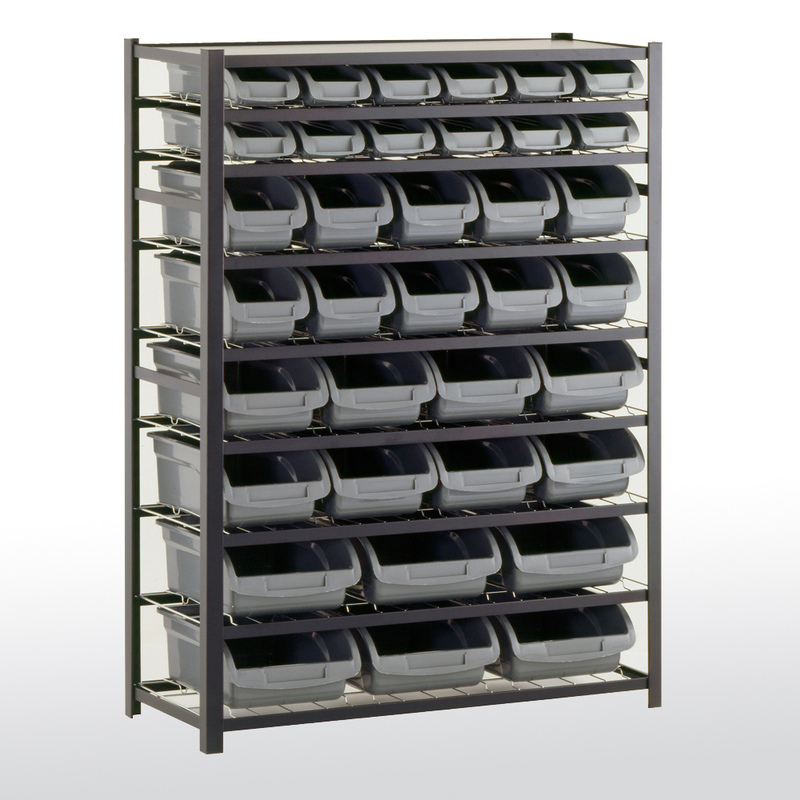 Maximum weight capacity per shelf is 100 lbs., evenly distributed. Chrome-plated finish. Durable welded wire construction with open design permits sprinkler, air and light penetration and reduces dust build-up. Shelves are adjustable in 1" increments. Includes four 2" nylon casters for easy mobility. Easy to assemble in just minutes without tools. 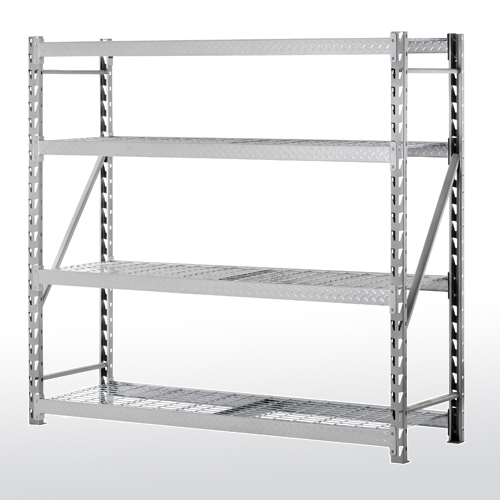 Maximum weight capacity per shelf is 200 lbs., evenly distributed. Chrome-plated finish. Durable welded wire construction with open design permits sprinkler, air and light penetration and reduces dust build-up. Shelves are adjustable in 1" increments. 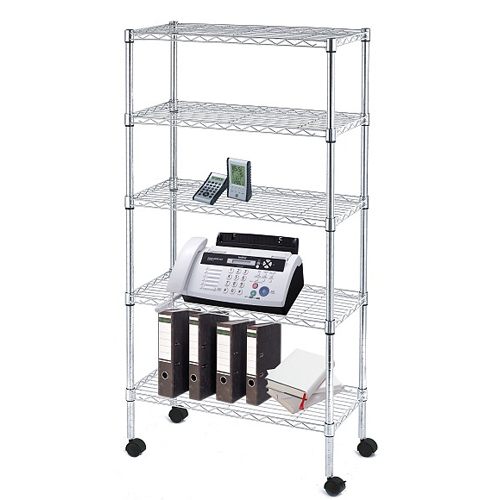 Includes four 2" nylon casters for easy mobility and four leg levelers to use as stationary shelving. Easy to assemble in just minutes without tools. 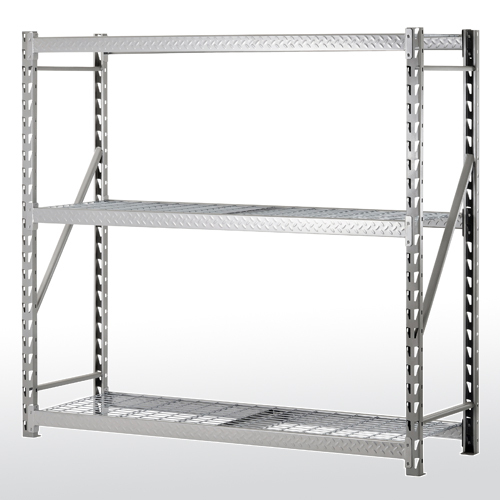 Maximum weight capacity per shelf is 200 lbs., evenly distributed. Black finish. Durable welded wire construction with open design permits sprinkler, air and light penetration and reduces dust build-up. Shelves are adjustable in 1" increments. Easy to assemble in just minutes without tools. 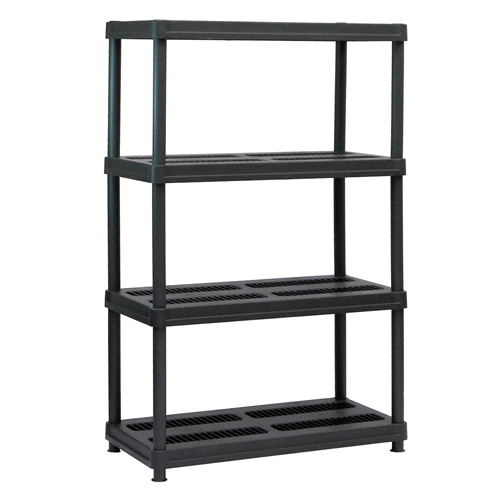 Maximum weight capacity per shelf is 85 lbs., evenly distributed. Chrome-plated or Black finish. Sturdy and durable welded wire construction with open design permits sprinkler, air and light penetration and reduces dust build-up. Ideal for home or business use. Shelves are adjustable in 1" increments. Easy to assemble in just minutes without tools. 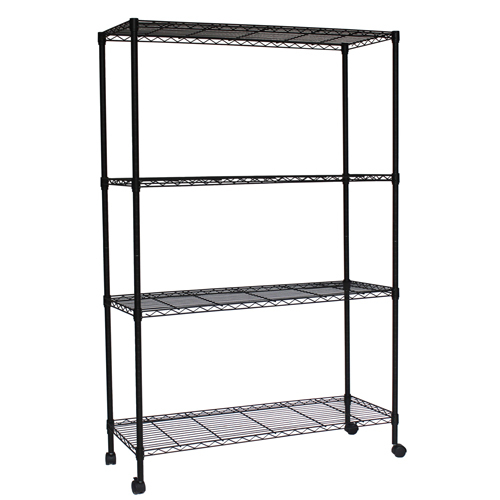 Maximum weight capacity per shelf is 85 lbs., evenly distributed. Chrome-plated finish. Durable and easy to assemble with no tools (except casters). 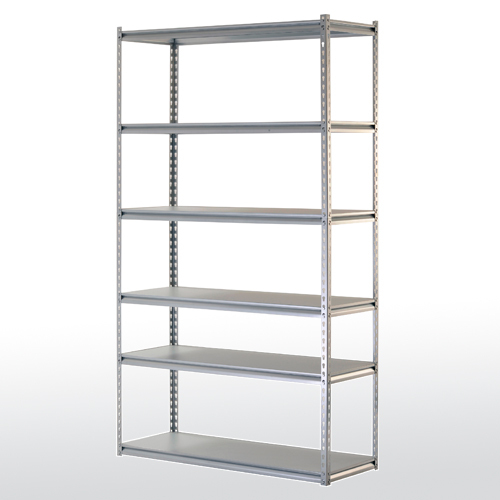 The split post design allows assembly as a 6-tier shelving unit or two 3-tier shelving units. Includes leg levelers and four 3" casters (2 locking) for mobile or stationary use. Shelves can be quickly adjusted in 1" increments. 200 lb. 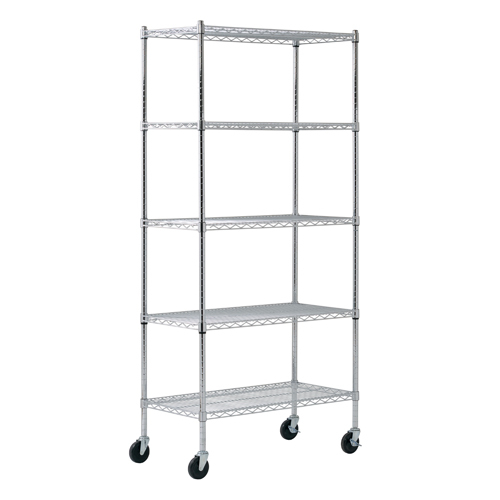 shelf capacity with casters; 600 lb. shelf capacity without the casters. Black finish. Ideal for laundry room, bedroom or closet. 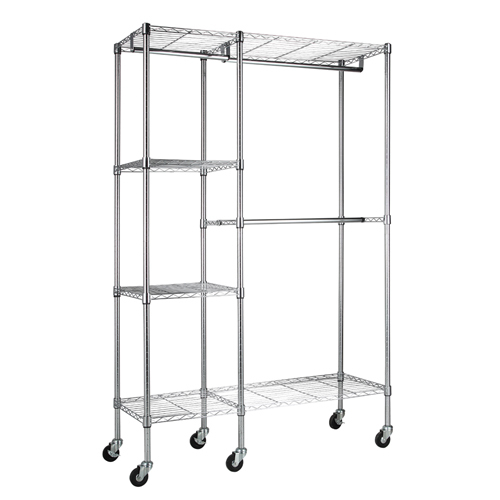 Features three hanger bars and four shelves adjustable in 1" increments. Six 3" casters(4 swivel, 2 locking) for easy mobility. 110 lb. shelf capacity. Easy to assemble. Holds 12 bottles total; 4 per shelf. 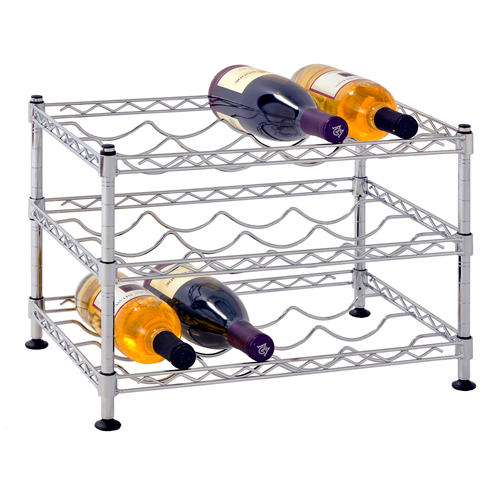 Grooved wire shelves hold bottles securely in place; great for display and flavor retention. Shelves are adjustable in 1 inch increments. Chrome finish for dirt and corrosion resistance and durability. Perfect option for your home, restaurant or bar. 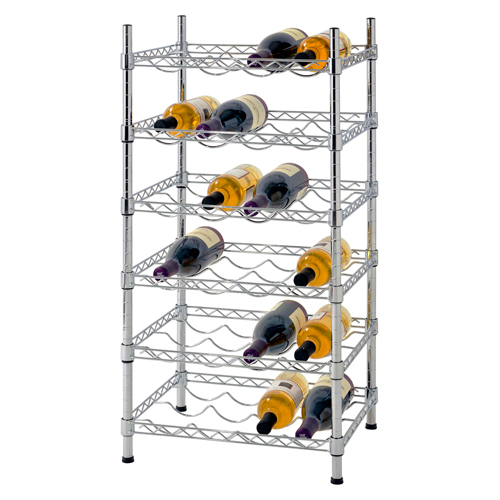 Assemble this wine rack in minutes without any tools and be ready to display your wine collection. Perfect for storaging smaller items. Open wire design permits greater penetration of water from fire sprinklers, permits more light and air circulation in the work space, and resists dust build-up. Shelves are adjustable in 1 inch increments for precise adjustment of shelf heights. 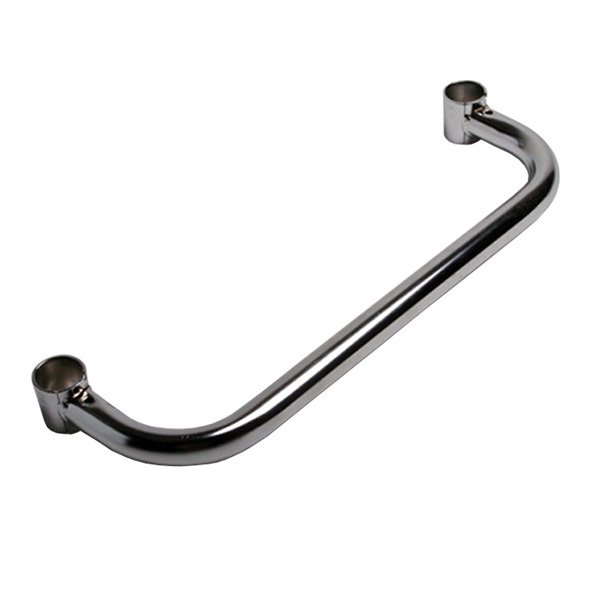 Chrome finish for corrosion resistance and durability. Supports up to 88 lbs. per shelf. Adjustable levelers for uneven flooring. Easy to assemble, no tools needed. Holds 24 bottles total; 4 per shelf. Grooved wire shelves hold bottles securely in place; great for display and flavor retention. Shelves are adjustable in 1 inch increments. Chrome finish for dirt and corrosion resistance and durability. Perfect option for your home, restaurant or bar. Assemble this wine rack in minutes without any tools and be ready to display your wine collection. Maximize your space by turning any corner into a functional storage area. Provides roomy storage to keep odds and ends, kitchen supplies, bathroom essentials, decorative elements, linens and more. 5 shelves creates more space in any corner of your place. The open wire construction maximizes airflow, and reduces dust accumulation. Integrated adjustable leveling feet keep the shelf level on uneven ground. White finish. 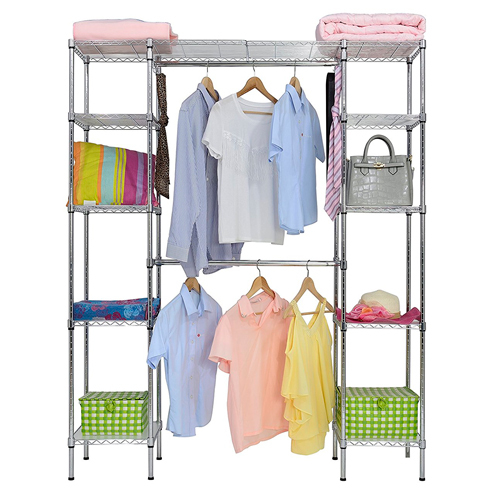 This steel garment rack features a chrome finish over a sturdy steel frame, making this unit the perfect blend of style and functionality. The design serves as both a shelving unit and garment rack. Perfect for closets, mud room, laundry room and durable enough for the garage. 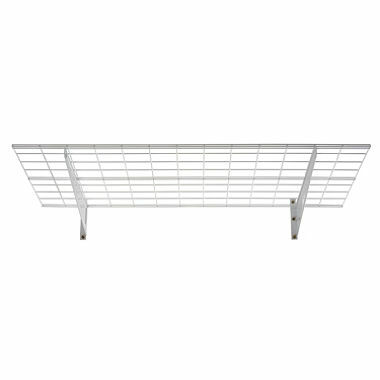 The two hanger bars expand from 28" to 50" in width to fit different space needs. Shelves are adjustable to accommodate different size items. 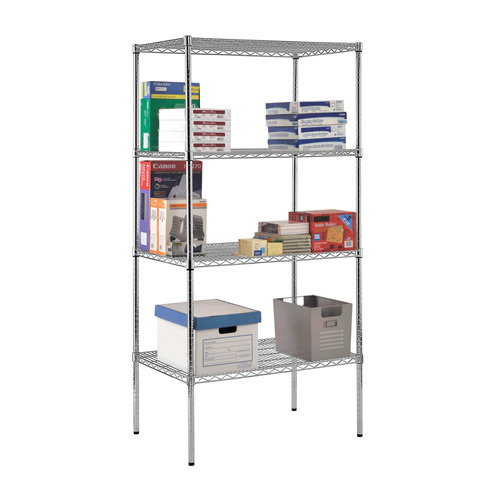 Includes: Two adjustable width hanger bar (28" to 50"), Eight 14"W x 14"D shelves and Two 28"W x 14"D wire shelves offer ample storage space. Easy to assemble. Holds up to 175 lbs. per shelf; 50 lbs. per hanger. 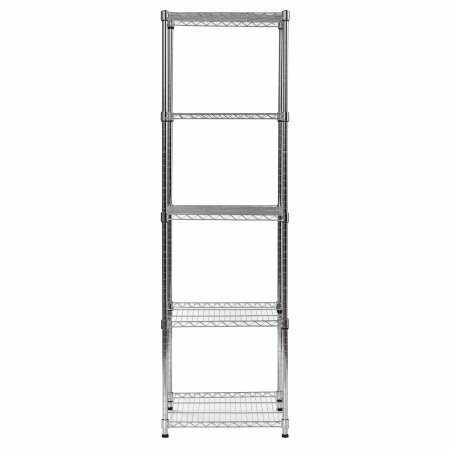 This Muscle Rack 10-tier Shoe Rack is designed to provide a great storage solution for your collection of favorite footwear. It is constructed out of metal pipes, non-woven fabrics tiers and plastic connectors, so it can hold numerous pairs of shoes. This innovative, lightweight space saving shoe rack can be placed in a cubby closet, mudroom or busy entryway to keep shoes or accessories accessible. 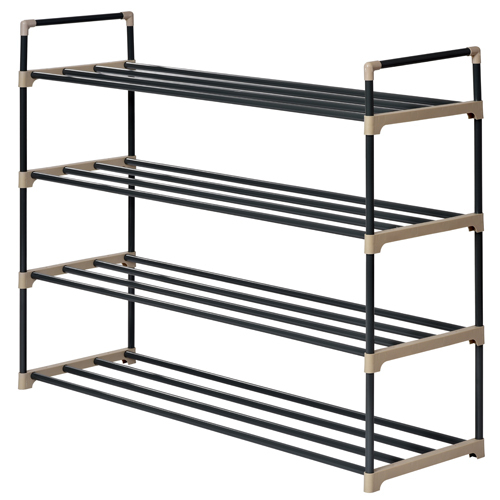 This Muscle Rack 4-tier shoe rack organizer is carefully designed and finely crafted with selected iron poles and plastic connectors. This shoe rack is of simple structure and yet practical and functional. The shipping box only contains 3 kinds of iron poles and 2 kinds of plastic connectors, which makes it very easy to assemble and disassemble in a few minutes. Keep your shoes well organized instead of scattering them around and making yourself embarrassed when having visitors. 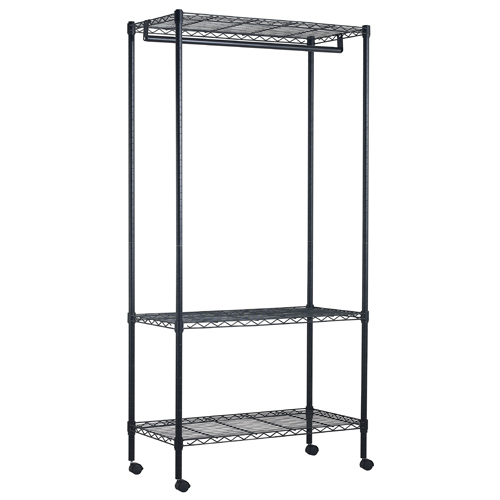 It’s a great storage rack for your doorway, entryway and closet. Shelves provide total 500 pounds of capacity. Install shelves side by side or separately. Steel construction with powder coated finish. Easy one-person installation with all hardware included. Multiple units connect to maximize storage. 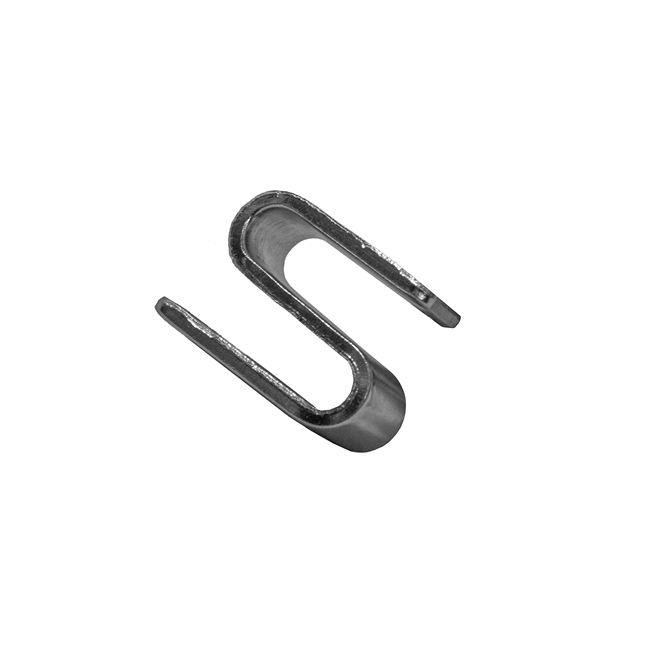 Suitable for securing to either wall studs or solid concrete wall. Instantly organize your messy items into neat condition with little effort. Large space. Quality made. Easy access. Easy assembly, the shelves slide on top of the clips that keep it in place, allowing you to choose your own shelf height. For your safety, please make sure the shelves are flipped the right way. In this way, the shelves will completely fit over and cover the plastic clips. 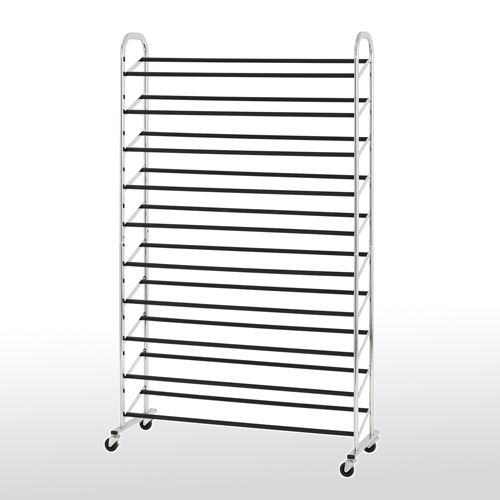 Slender size rack for smart storage in narrow space or room corner to store odds and ends, books, decorative elements, kitchen supplies, bathroom essentials and others, perfect for use in kitchen, living room, bedroom, bathroom, laundry, office, etc. 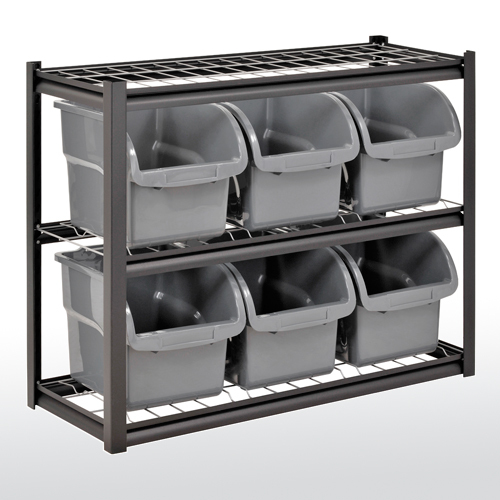 Features 15 heavy duty black plastic bins in three different sizes for maximum storage and organization. Five wire chrome shelves have guide rails to keep bins in place. Top shelf can be used for additional storage space and includes a plastic liner. Heavy duty swivel casters, 2 with locking brakes. Easy to assemble. Durable chrome finish. Bins sizes: Small bin (5) is 15-1/4"D x 5-1/2"W x 3-1/4"H; Medium bin (4) is 15-1/4"D x 7-1/2"W x 6-1/4"H; Large bin (6) is 15-1/4"D x 10"W x 6-1/4"H.
Zinc coated wire shelving with black powder coat steel frame. Shelves have 50 lb. capacity. Top shelf for additional storage and 2 shelves that contain 6 gray bins. 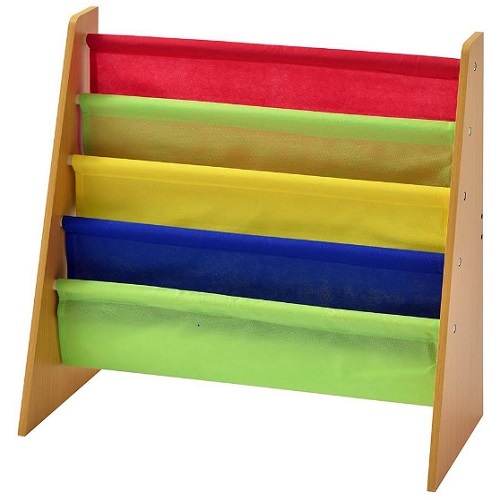 Bins size is 12-1/4"W x 14-1/2"D x 12-1/4"H.
This book and toy organizer features a fun and functional design. It has a large storage capacity in an easy to see and access system. This kids’ bin organizer stores the books with the covers facing forward, making them easy to recognize. It is made from a strong MDF construction with a natural finish. This item comes with four regular size bins and two double size bins. It also has three fabric pockets for extra storage. 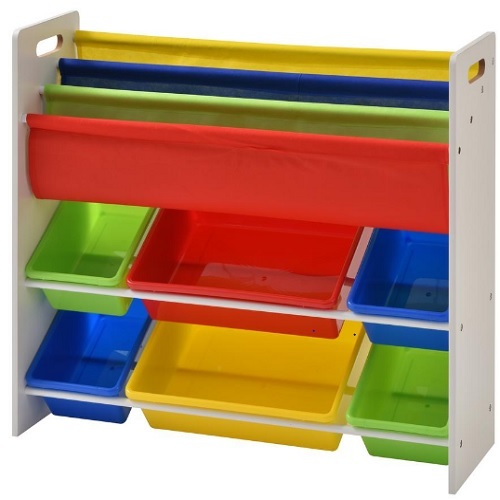 Compact 4 level bin organizer with 12 multi color bins: 4 large bin measure 16-1/2” x 11-1/2“ x 5-1/4“, 8 small bins measure 8-1/8” x 11-1/2“ x 5-1/4“. Bins are safe for kids and BPA free. 2 color versions: Primary color bins with natural wood-tone panels or pastel color bins with white panels. Laminate side panels make for easy cleaning. Convenient side handles for easy lifting and carrying. KD - Easy assembly. 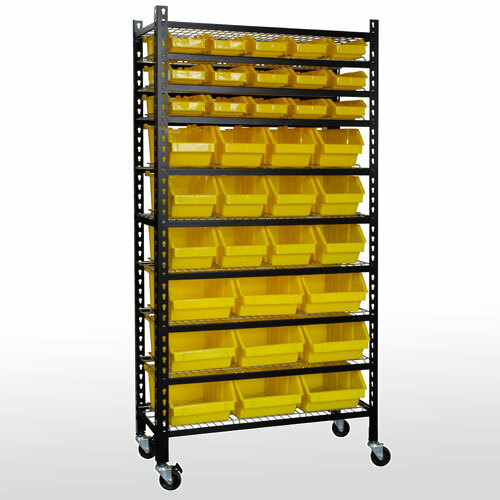 Durable 16-gauge rivet-lock steel shelving includes three different size yellow polypropylene bins. Open bin front for better visibility and access. Wire shelves with rails keep bins in place. Shelves adjust on 1-1/2" increments. Four casters, two with brakes for easy mobility. Holds up to 500 lbs. of evenly distributed loads. Tough powder coated finish in black. Includes: (9) Large bins: 10-1/2"W x 15"D x 6"H, (12) Medium bin: 7-1/2"W x 15"D x 6"H, (15) Small bins: 6"W x 15"D x 3"H.
This double-sided unit provides more storage space. 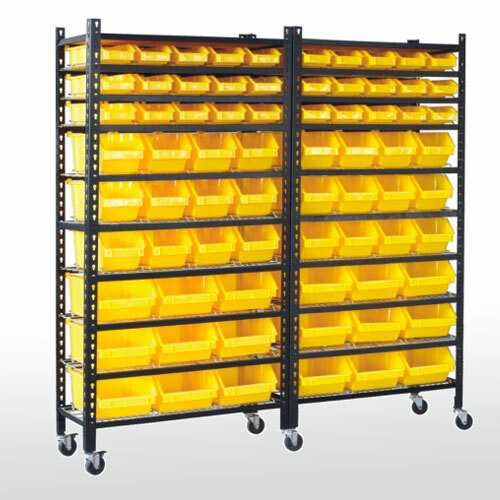 Durable 16-gauge rivet-lock steel shelving includes three different size yellow polypropylene bins. Open bin front for better visibility and access. Wire shelves with rails keep bins in place. Shelves adjust on 1-1/2" increments. Four casters, two with brakes for easy mobility. Holds up to 1000 lbs. of evenly distributed loads. Tough powder coated finish in black. Includes: (18) Large bins: 10-1/2"W x 15"D x 6"H, (24) Medium bin: 7-1/2"W x 15"D x 6"H, (30) Small bins: 6"W x 15"D x 3"H.
Sturdy engineered wood construction is easy to assemble and clean. Five deep, fabric sling sleeves hold books of almost any size. Space-saving design, perfect for book storage in your toddler’s bedroom, playroom, nursery, or the living room. 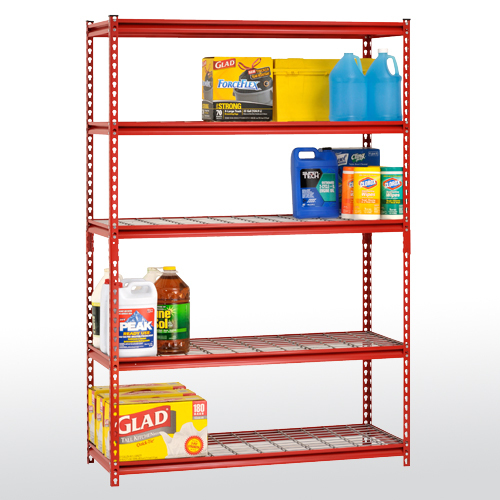 Durable, ventilated resin shelving will never rust, dent or peel and is chemical resistant. Can be used indoor and outdoor. Easy to assemble in minutes - no tools required. Color black. These Mobile Storage Racks are a perfect solution for organizing and maximizing your cluttered home or office storage space! The open design makes it easy to store bins, supplies, paper, etc. These handy rolling shelves give you the freedom to customize your storage area. 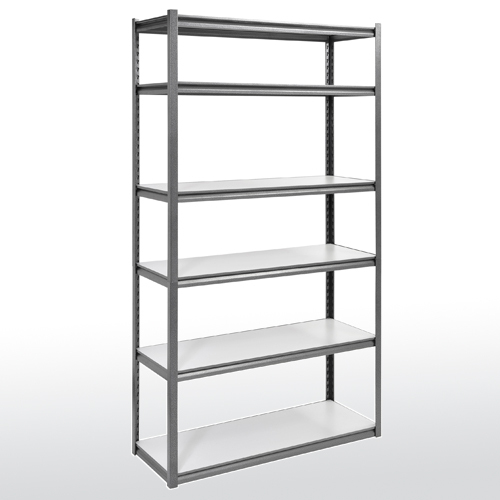 Create isles or sections by combining four (5418) and two (5419) shelf units. Once the rack has been placed into position lock the casters to prevent movement when loading and unloading the shelves. Get organized and free up valuable floor space with this 10-tier shoe rack. Holds up to 50 pairs of shoes. Includes four casters with brakes to easily move around as necessary as well as lock them in place. It's non-slip tubes secure your shoes in place, while it's open shelves enable quick identification of the pair you need. 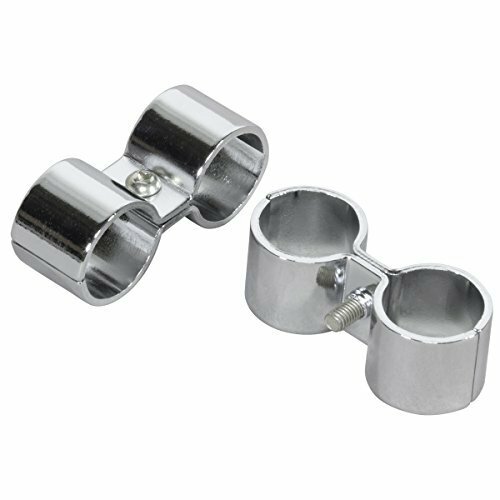 Durable chrome and metal construction. 90 lb. weight capacity. Industrial strength welded steel frames and beams. Treadplate embossed beam design. 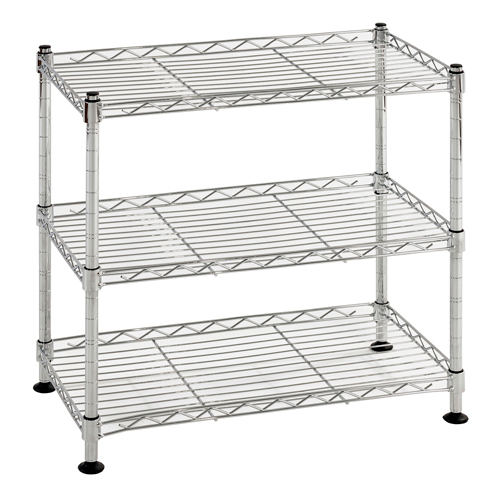 Heavy duty wire shelves adjust in 3" increments to fit multiple storage need. 1200 lb. shelf capacity, based on evenly distributed loads. 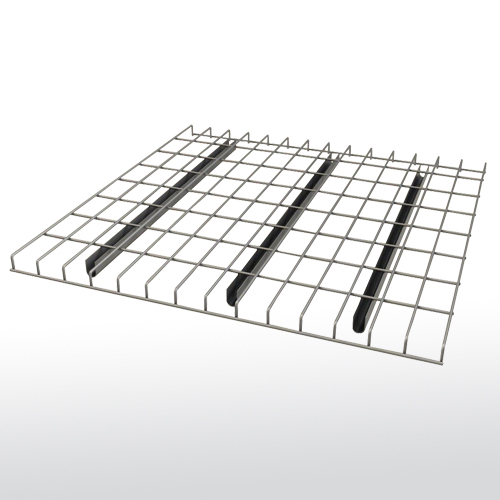 Center support channel provides additional support to wire shelf. Assembled in minutes. NSF Certified. Industrial strength welded steel frames and beams. Treadplate embossed beam design. 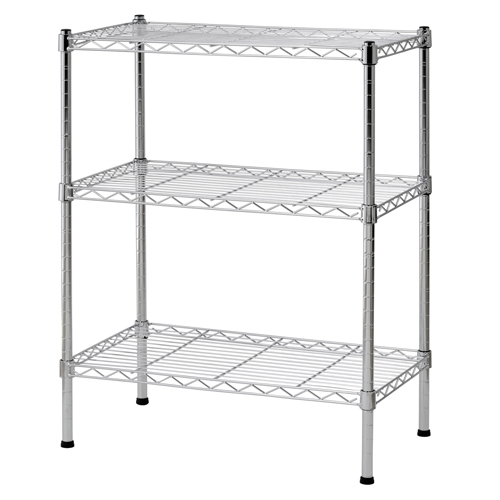 Heavy duty wire shelves adjust in 3" increments to fit multiple storage need. 1200 lb. shelf capacity, based on evenly distributed loads. 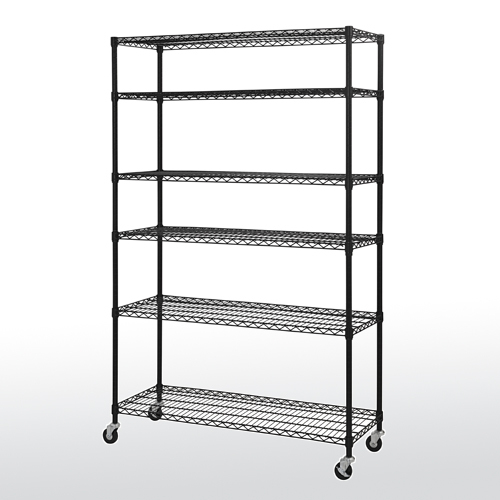 Center support channel provides additional support to wire shelf. Assembled in minutes. NSF Certified. Available in 3 sizes. Perfect for organizing your garage, home, or workshop. Durable welded steel construction with bronze finish. Its includes reversible light and dark woodgrain shelves. The three adjustable laminated shelves provide ample storage space to accommodate a variety of items, with each shelf supporting up to 500 lbs. Perfect for organizing your garage, home, or workshop. 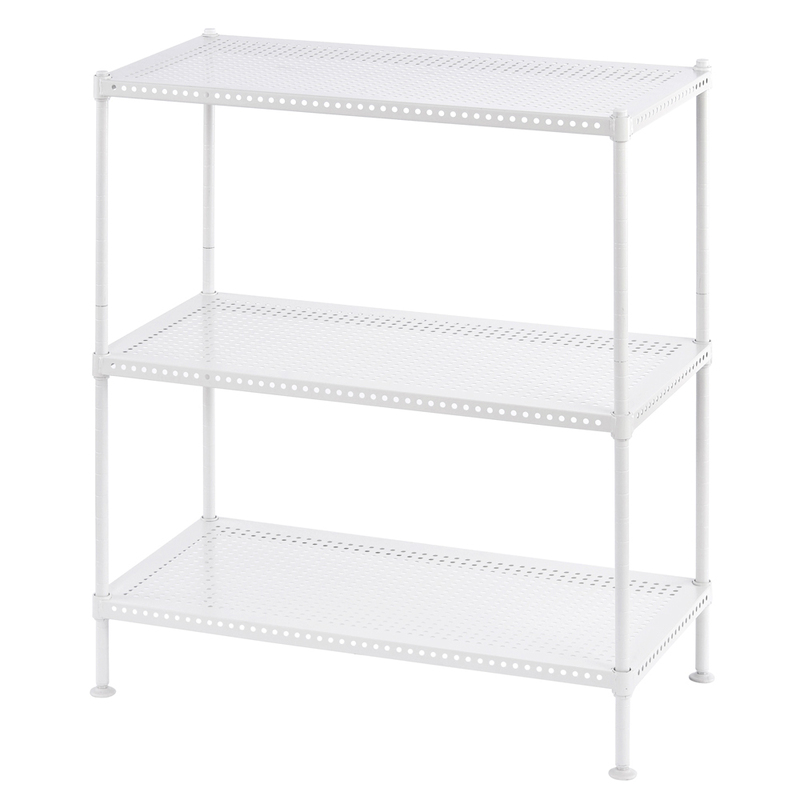 Durable welded steel construction with white powder coat finish. 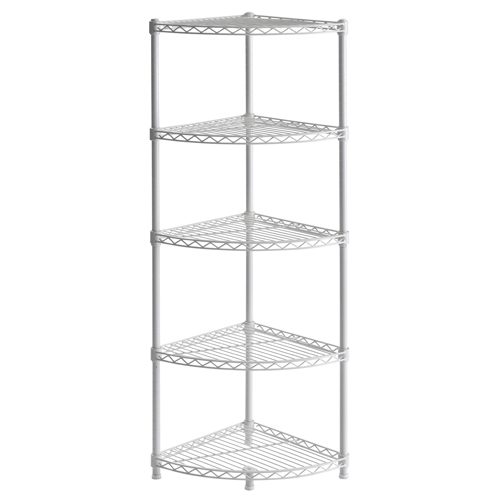 Includes durable wire shelves that adjust to accommodate variety of items. Each shelf supports up to 350 lbs. Free up floor space for storing holiday decorations, luggage, coolers, sports equipment, totes and much more. Made of durable steel construction. 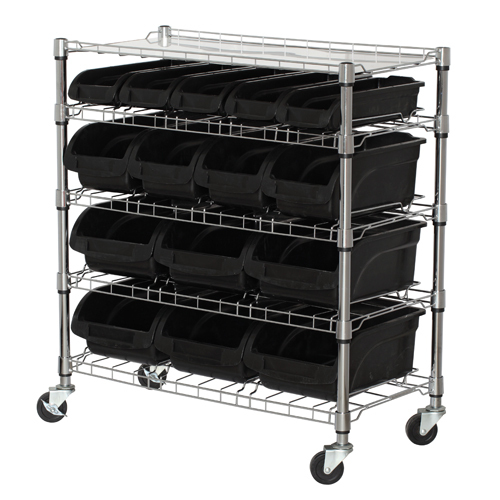 Holds up to 300 to 600 lbs capacity of evenly distributed weight. Heavy duty wire decking allows visibility to content and reduces dust accumulation. Height adjustable to accommodate different size items. Powder coated silver vein finish protects against rust, scratches and temperature changes. Heavy-duty 13 gauge welded roll formed steel construction. Features teardrop punch pattern every 2” for flexible beam adjustability. Horizontal and diagonal braces create a strong, stable system. Welded pre-punched footplates for easy anchoring. Durable powder coat finish in green. Heavy-duty 16 gauge roll formed welded steel. 1-5/8” high step to accommodate cross bars and decking. Interlock stud and keyhole connection automatically locks into columns. Piston lock secures beam into place. No tools for installation. Durable finish in orange. Order 2 beams per shelf level. Heavy duty 5-gauge wire mesh allows visibility, air and sprinkler penetration for enhanced fire safety. Easy to install, the waterfall style decking wraps over the beam to provide a secure brace, eliminating movement between deck and beam. Includes three front-to-back support channels. Powder coat finish. Installs between two beams to assist in supporting pallet loads. 16 gauge steel with pre-galvanized finish. 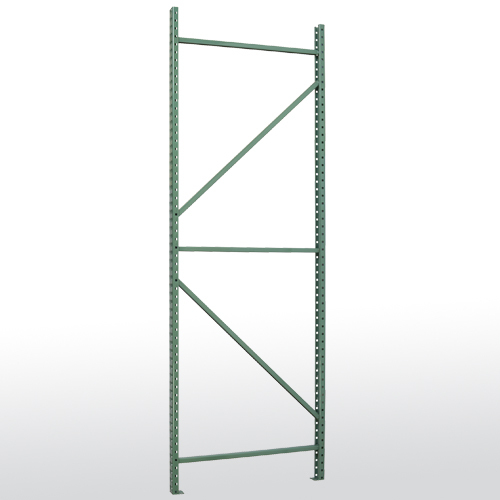 Complete heavy duty pallet rack system includes (2) upright frames, (6) beams, (6) wired decks. Features a teardrop punch pattern every 2" for flexible beam adjustability. Horizontal and diagonal braces create a strong, stable system. Piston lock secures beams into place with adjustable shelves that are easy to install. 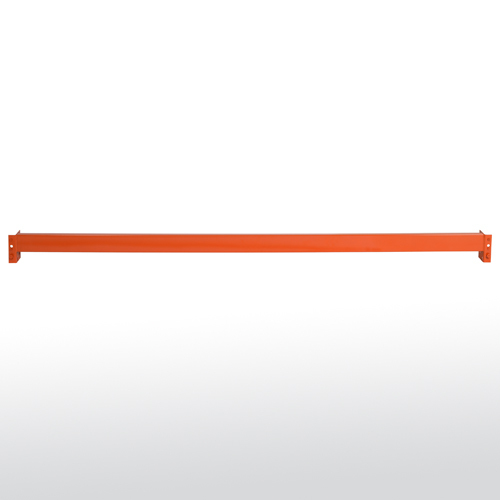 Durable powder coat finish in green (frame) and orange (beam). 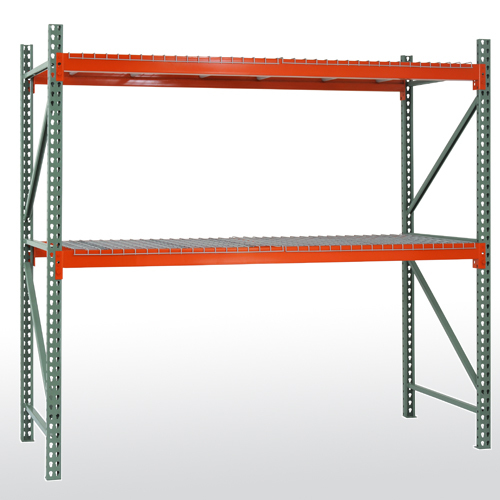 Complete heavy duty pallet rack system includes (2) upright frames, (4) beams, (4) wired decks. Features a teardrop punch pattern every 2" for flexible beam adjustability. Horizontal and diagonal braces create a strong, stable system. Piston lock secures beams into place with adjustable shelves that are easy to install. Durable powder coat finish in green (frame) and orange (beam). Raises load from 3" to 7-1/2" high. Tapered ends and dual entry rollers on the forks ensure accurate and smooth entry into pallet. Spring loaded pump handle, sealed hydraulic lift and integrated grease fittings. Fingertip lever controls include raise, lower and neutral operations. Swiveling 7" nylon rear wheels and 3" nylon front rollers. Outside fork width is 27". Width between forks is 14-3/8". Each fork is 6" wide and 2" thick.